Gold panning is a basic skill that every prospector needs to learn. Regardless of the size of your mining operations, you will eventually need to use a basic gold pan to evaluate the amount of gold present in an area. 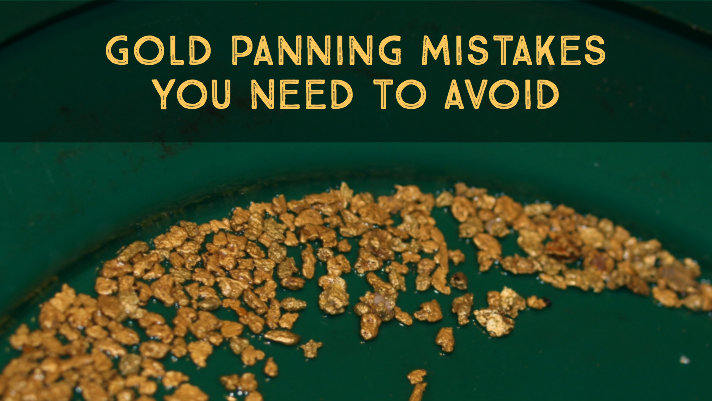 The basic skill of gold panning isn’t hard to learn, but beginners often make simple mistakes that cause gold to be lost from their pan. Here are a few common mistakes that you should be sure to avoid. Before the panning even starts, you need to make sure that you have a gold pan that is the right size for you. Many people think that bigger is better, but the exact opposite can actually be true. A bigger pan will hold a lot of gravel, but the downside is that a full pan will be very heavy. When you start agitating the material the weight might be too much. The result is a sloppy panning technique that will result in losses. It also won’t take long before your muscles get sore. Use a medium sized gold pan or even a small pan to do your sampling. Besides, once you have determined that there is a good concentration of gold in an area, you will want to start using larger equipment anyways such as a sluice box. Modern plastic gold pans come in a variety of different colors which help to make specks of gold easier to see. Common colors include black, green, blue and red. These colors are all good, but different people have different vision, so try some different colors for yourself to determine which color you like best. When you put some gravel into your gold pan, take some time to pick out the larger rocks that are obviously not gold. There is no need to deal with the extra weight of the rocks. Saturate the contents of the pan and agitate the material. Large rocks will come to the top and can easily be picked out. Rinse them off carefully before removing them to assure that no gold is sticking to them. Using a classifier can speed up the process. This separates rocks and large gravel pieces and lets the sand and finer material to fall through. This also allows for maximum panning efficiency which will result in better gold retention. Clays are sticky, and they will trap fine gold preventing it from settling down into the bottom of the gold pan. Before you tip the pan and let material out of the gold pan, make sure everything is broken up. Use your hand to break apart any clumps of clay. Make sure everything is nicely separated and then agitate the pan without tipping it, allowing gold to settle to the bottom. Stay focused while you are panning. It takes several minutes to complete the panning process, and I have seen that people often get a bit ‘sloppy’ after a few minutes due to fatigue. This is one of the reasons that most people should use a smaller sized gold pan. Take your time and make sure you keep that gold in your gold pan! When all of the gravel is gone out of your pan, you should get down to the blacks sands, maybe some garnets, and hopefully gold. Since this is all heavy material with a high specific gravity, separating the gold from the other minerals can be challenging. Use a snuffer bottle to carefully blow away the black sands and expose the gold. It takes some practice to get the right amount of pressure to cause the right separation. Take some time and make sure you get all the gold.